Thank you for expressing an interest in being a volunteer for Caledonia Little League (CBSL). CBSL can only be as successful as the strength of its parent/volunteer support. We recognize that our Coaches, Assistants and other volunteers make a significant contribution of time and effort to enhance the experience of playing Little League Baseball & Softball. It is the goal of CBSL to provide the best coaching instruction to our participants while maintaining a positive team environment. All candidates will undergo a background check as required by Little League. NOTE: You will need to scroll through registration page until you find the "2019 Volunteer Registration" section. Attention all CBSL managers and assistant coaches! Michigan State Law requires all coaches, employees, volunteers and other adults involved with a youth athletic activity (CBSL) to complete a concussion awareness on-line training program. This Law went into affect June 30, 2013. Please follow this link and get certified today! https://www.cdc.gov/headsup/youthsports/training/index.html. IMPORTANT NOTE: upon completion print the certificate with your name to PDF or you may risk having to start over from the beginning. Then upload the certificate to your Volunteer Registration. You will not be allowed on the field until this is completed! 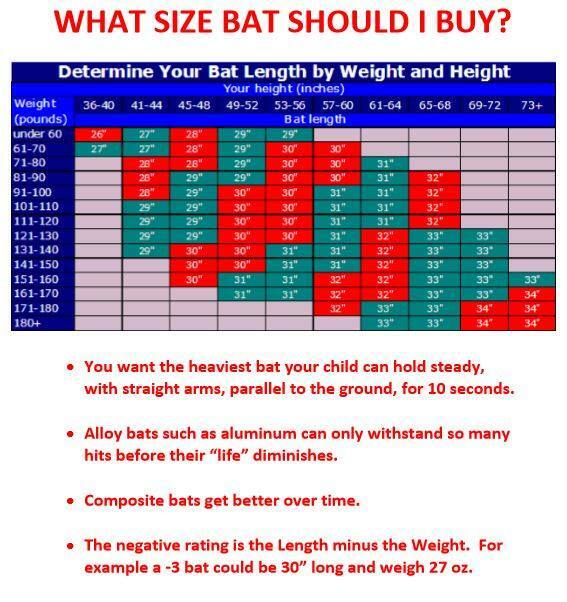 Bat Sizing Guide *- A guide to properly sizing a bat. Please remember that the bat must meet Little League requirements and must be on their approved bat list. Double check before you purchase a non-returnable bat.